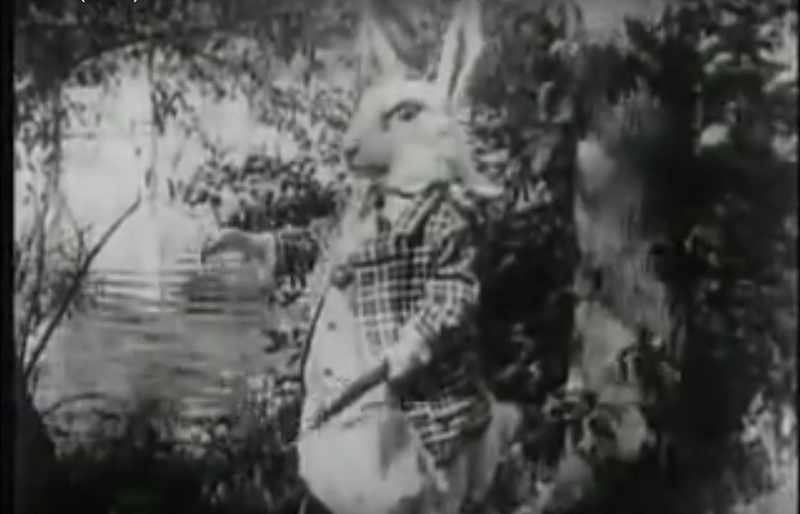 This was (at least) the third version of Lewis Carroll’s classic children’s fantasy to be brought to the screen in the silent era, and it would be followed by many more versions, good and bad, in years to come. I suspect that the print that is readily available today is incomplete, but as always we have to judge based on what evidence we can find. Alice (played by Viola Savoy, who is a bit too old for the part, in my opinion) is established in her “normal” world, with her mother and older sister. Her mother is working in the kitchen making tarts, and Alice drops some playing cards on the floor. Then her sister takes her outside, and she sees a rabbit, a cat in a tree, an owl, and a pig. Then she lies down for her nap. As soon as she “enters Dreamland” the white rabbit appears and beckons for her to follow. She follows him down a rabbit hole and up to a set of doors, and a mouse tells her how to get through to the garden on the other side. Once through, she joins an animals’ convention, but she scares them away, bragging about her cat’s ability to chase mice and birds. Then she finds the rabbit at his house, goes inside and finds his fan and gloves, but he has already rushed off to the Duchess. 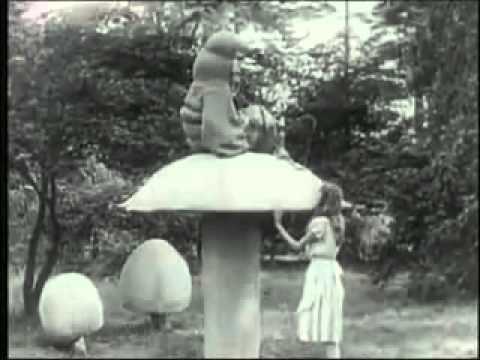 Next she meets the caterpillar on his mushroom, and he has her recite “You Are Old, Father William,” which we see acted out by people in funny costume. Alice arrives at the Duchess’s house just in time to see the arrival of an invitation to the Queen’s Croquet Game. She meets the Duchess, whose cook is overly fond of pepper and is making everyone sneeze. When the Duchess’s baby sneezes, she beats him, but Alice takes the child away, and it turns into a pig. 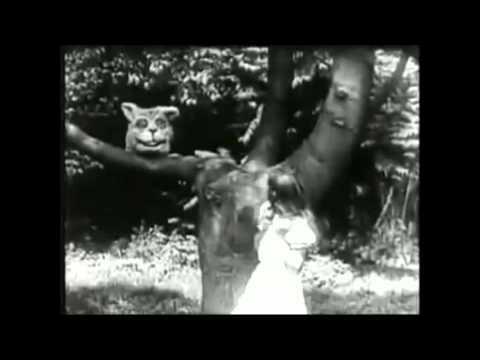 She then meets the Cheshire Cat, who appears and disappears several times until his body disappears, leaving his grinning head behind. Now, she enters the Queen’s garden and sees low-ranking cards (the gardeners) painting white roses red. The Queen arrives and orders them to be executed, but Alice joins her for croquet. The cards serve as arches, the ball is a hedgehog, and the mallets are flamingos. Alice does well, but the Queen orders her beheaded, then loses all control and orders the headsman to behead everybody. Alice escapes in the confusion, and the Queen takes her to meet the Gryffon and the Mock Turtle, who show her the Lobster’s Quadrille. Finally, she returns to the Queen’s Court in time to see the Knave tried for stealing tarts. She cries, “You’re nothing but a pack of cards!”and awakes in the garden with her sister. Overall, this movie doesn’t live up to the high standards of 1915, but since it was released in January, we have to give it some slack. The camera doesn’t move, there are no close-ups, and the only real editing that takes place is between narration of the “Father William” poem and its depiction. Otherwise, cuts only happen when the action moves to a new location, but that does happen quite frequently, giving it a sense of motion above that of many similar movies. Its production standards are similar to the “Oz” films of 1914, and while the effects aren’t as good, the costumes are better, it sticks closely to its source material and tells its story more effectively than those films did. 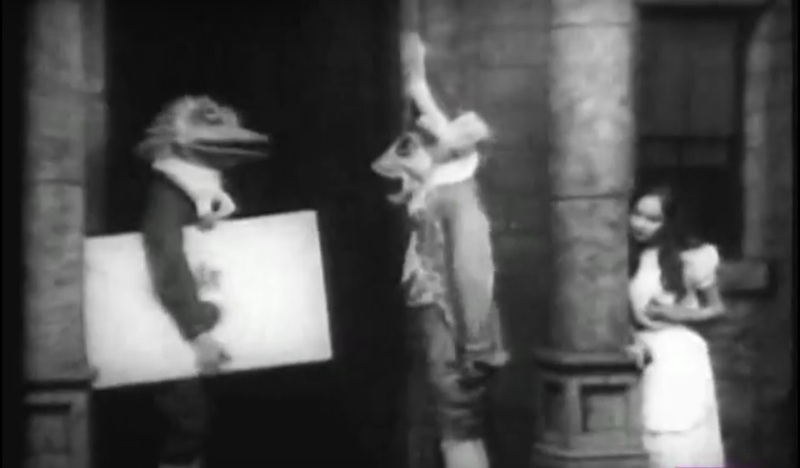 The still image at the “Silent Era’s” page for this movie shows the mad tea party, but this doesn’t occur in the version I was able to watch, suggesting that it may have been longer originally. Viola Savoy is quite grown-up and is actually taller than some of the adult actors, while I’ve always felt that Alice is meant to be a young girl. In general, however, this should please fans of the book and of early cinema.